After a great season in 2017, I set my sights on the 2018 World Championships in Innsbruck, Austria, where my goal is to compete in all three disciplines of Lead, Speed, and Bouldering to prepare myself for the Olympic format. Having made the Semi-Finals for the first time in Wujiang, China, I was already pre-selected as a member of the International Lead Team, and so the next step for me was to try and qualify for Bouldering. I worked really hard to prepare for the 2017 Bouldering National Championships after a mammoth effort overseas, and in what was quite a tough competition for me, I finished 10th. I knew my result could have been better, but I was satisfied, nevertheless unsure as to whether or not it would be enough to warrant selection. 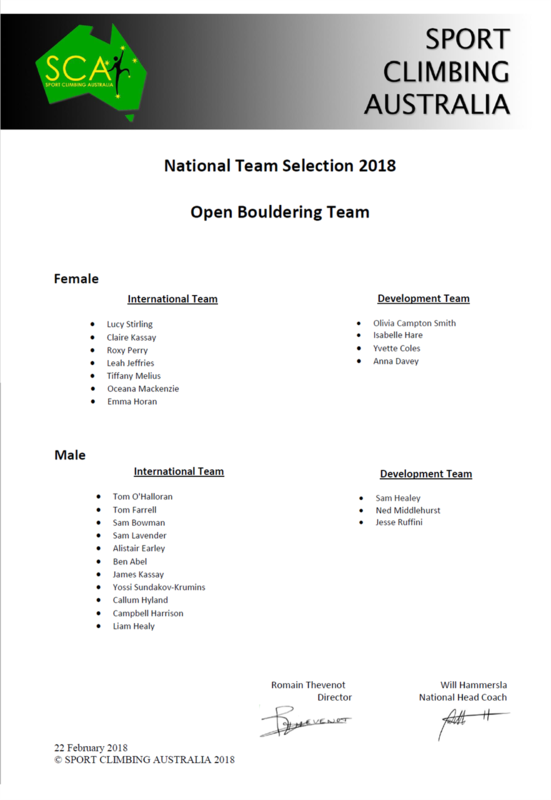 I couldn’t have been happier to receive my invitation to represent Australia on the International Open Bouldering Team. As such, alongside the lead season I will be competing in the Bouldering World Cup in Munich, Germany, and the World Championships in Innsbruck. I’m now at work to prepare for the Australian National Lead and Speed Championships in Melbourne in over a month’s time. Whilst there have been some pretty major setbacks, I’m determined to put myself in the best shape possible, to give my all, and to hopefully earn myself a place to compete internationally in Speed, rounding out a Combined showing in Innsbruck, and a step closer to the Olympic dream! Sport Climbing Victoria would also like to congratulate fellow Victorians Claire Kassay, Oceana Mackenzie and James Kassay for being selected to the Australian Open Bouldering Team and Ned Middlehurst who has been selected for the Australian development team. We wish you all the best of luck on the world circuit! To view the entire team, click here.